Ireland had been a member of the European Economic Community since 1973, when a majority of the Irish electorate approved a referendum on membership. With membership written in to the Constitution, any future changes to the terms of that membership, or indeed to the structure of the EEC itself, would require a new referendum each time. The first of these changes arrived in 1987, fourteen years after membership. Growing dissatisfaction amongst the EEC members about the lack of free trade amongst themselves resulted in moves to standardise the trade laws of each of the members. The Single European Act was drafted with the intention of creating a "single market" within the EEC by 1992. The act also sought to introduce what became known as the "co-operation procedure", whereby the European Parliament would enjoy enhanced legislative powers. The majority of the member states ratified the Act in their national parliaments, but Denmark and Ireland put it to a referendum. In the Danish case, the opposition voiced concerns that the European Parliament could become too powerful, but the Act was approved by 56% of the Danish electorate. 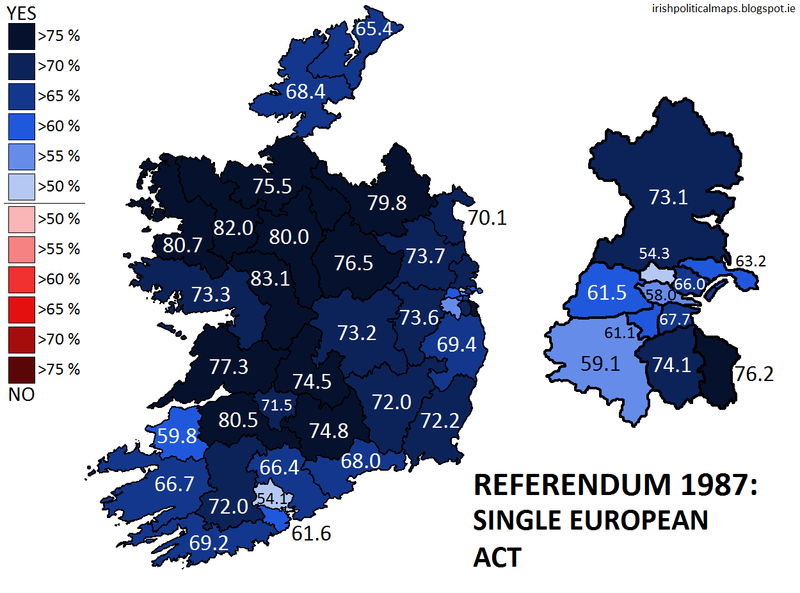 In Ireland, the referendum was initiated by the Fianna Fáil government and jointly supported by the Fine Gael and Progressive Democrat parties in Opposition. Labour and the Workers' Party opposed it. Labour in particular was concerned that Ireland would lose out on many of the supposed benefits that would come in 1992, that fiscal harmonisation would hurt the less well off and that the Act could diminish Ireland's neutrality. Harsher criticism came from smaller groups, particularly Christian-aligned groups, who warned that Ireland would lose its independence and have its laws changed by Europe. Conversely, the Government warned that a No vote would bring economic disaster and extolled the many benefits Ireland had enjoyed from EEC memmbership to that point. In the end, the electorate was strongly on the side of the Government, with 69.9% (out of a turnout of 44%) voting to approve the Single European Act. 30.1% voted against. The Government did not lose a single constituency, though Cork North Central and Dublin North West returned the lowest Yes results at 54.1% and 54.3% respectively. The highest was recorded in Galway East, with 83.1% in favour. In general, the strongest Yes votes came from Connacht and northern Munster, as well as the Dún Laoghaire area. With all countries successfully ratifying the Act, the EEC undertook a new stage in its development. In the much talked about year of 1992, another referendum on the issue would be forthcoming, and from that referendum, many more would follow.